In my family, growing up, it was treasonous to listen to Christmas music before Thanksgiving. For some reason, even though I hated this as a kid, it’s something I hold to pretty firmly in adulthood. 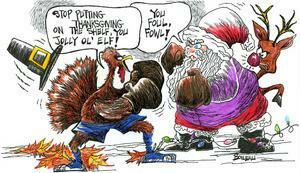 Thanksgiving deserves to be observed without Christmas getting all up in its business, you know? That said, once the Turkey has been served and the clock strikes midnight, when others are hauling rear-end to the malls for Black Friday deals, I am queuing up the KING of all Christmas playlists. In honor of this tradition, I thought I’d share some of my absolute favorite Christmas songs, just in case you need to expand your own playlist this year. Hopefully that is a good bit to get you started, if not through the next 9 days until Christmas music again becomes off-limits! Happy Advent to you all!!! « Good Tid(y)ings for Comfort and Joy!